Bottle Opener Carabiner Keychains Customized in 3 Days! 3 day production on our Bottle Opener Carabiner Keychains sized at a full 3" long, making them easy to use, and providing a large 2" x .2" engraving area. 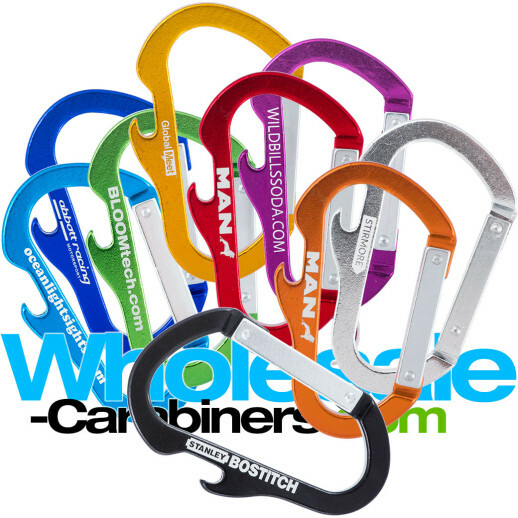 A carabiner is always awesomely cool with your custom engraved branding message and our economical wholesale pricing — and these double the awesomeness! Clip one to your belt and always have a bottle opener within reach. Users will also appreciate that they feature a safe, finger-friendly opener design. Oh, and they are ready in a fast 3 days! Item size: 3" x 2"
Engraving area: 1.75" x .15"